Here are a few tips for decorating your apartment for spring! The weather is warming up and the sun is shining, meaning spring has finally arrived! 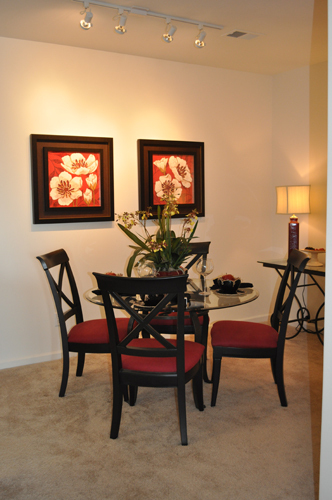 The start of a new season always brings many changes and is a great time to add new decorations to your apartment. Decorating your apartment doesn’t need to be expensive, as rearranging furniture and adding a few pops of color to a room can make a huge difference. Continue reading for a few more tips on how to decorate your apartment for spring! One of the easiest ways to freshen up your apartment to spring is with some new plants and flowers! Decorating your living area or kitchen with green plants and colorful flowers not only adds a great pop of color to any room, but it’s also always good for your health. Plants benefit your physical and mental state and can help you feel more relaxed and stress-free. Plants also have air-purifying benefits, and certain plants remove chemicals in the air from cleaning products or increase air humidity in a room. If the floor in your living room is plain and boring, a brightly colored rug makes a huge difference. Area rugs are great for apartments, as they can be layered over any type of flooring, including carpet. Whether you want a small rug for the coffee table or a larger rug that fits most of the room, colorful and patterned rugs are an easy way to bring life to any room. If you aren’t allowed to paint the walls of your apartment, why not paint some furniture? A newly painted bed frame or desk makes just as much impact as a painted wall, and can instantly add a new vibe to a room. Choose colors like blush, orange, reds, or greens to transform your apartment with the new spring season. After a long winter, we’re all craving the sunshine. Open up your apartment by allowing as much natural light as possible into your home. Start by removing window treatments, or at least switching to curtains of a lighter color and fabric. Next, clear the space around your windows to ensure you let in as much light as possible. Place mirrors strategically around your rooms, as reflective surfaces can really expand the reach of natural light. Put mirrors and any on the east facing walls, and track the sun beans in your apartment to know where to decorate with glass or shiny metal objects. This entry was posted on Friday, April 13th, 2018	at 3:25 pm	. Both comments and pings are currently closed.